Have you ever noticed that the level of singing activity by birds changes during the day? Bird singing varies throughout the day and generally follows a circadian (daily) rhythm, usually along what’s known as a bimodal pattern, i.e. two main periods of singing activity. In the case of most birds, there is much singing during the early morning and a lower level of singing in the evening. The majority of passerines sing only during the daylight hours, although some species do sing in the dark, pre-dawn period and a very few are nocturnal singers. Bird species in temperate regions, (which includes most of the USA, and southern Canada) where the photoperiod is a well-defined light-dark cycle, possess singing patterns that parallel the daylight portion of the cycle. In other words, they restrict their singing to the daylight hours. 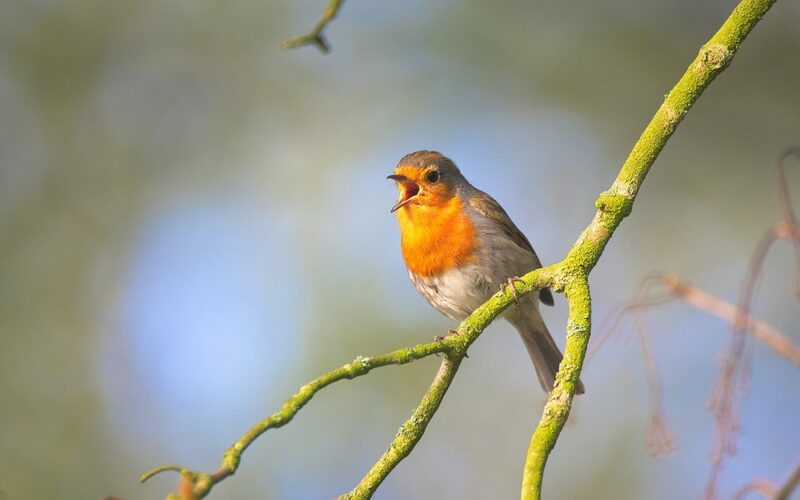 This circadian singing pattern is dominated by the dawn chorus, the time of greatest singing activity, which begins just before sunrise and continues for several hours thereafter. There are several possible reasons why this is a preferred time of day for singing: highly favorable acoustical (i.e., sound) conditions in the environment for song propagation, a more efficient use of energy in the “dusky” dawn light than is foraging (which is the major competing activity at this time of day), attraction of potential female mates, or territorial advertisement to counter the high risk of intrusion by other males into a bird’s nesting territory. The high frequency of singing during the dawn chorus results in the presence of high levels of interference from the songs of other birds. To counter this ‘masking’ effect of the other songs, some species have evolved the use of certain strategies to maximize the broadcast of their own songs; they have adjusted their singing rhythms just enough to ensure asynchronous (i.e., offset) singing with nearby competitors. In this way, there is a lower level of singing activity during the time in which a bird wants to sing, which means it is more likely that the other birds he hopes will hear his song (potential female mates and males on adjoining territories) will be able to hear him. Some bird species also use asynchronous singing during other times of the day, for instance, waiting until considerably later in the morning to begin their most intense period of singing. And still some other species possess very different circadian singing patterns, to the extent that they have become late evening singers. Singing patterns are not static phenomena throughout the breeding season. Changes in singing activity in relation to stages of the breeding season have been recorded by many scientific researchers. These stages include the mate attraction, pair formation, incubation and nestling periods. Changes in singing activity due to breeding chronology have been found in many species, especially in regard to pair formation and the feeding of nestlings. This change is usually a steady decrease in, or complete cessation of, singing activity soon after pair formation, but some periods of subsequent increase in singing activity have also been found. The effects of weather on the frequency and timing of bird singing have also been the subject of many research projects. Weather variables which have been shown to affect singing activity include air temperature, humidity and wind speed. The most important weather-related factor, though, may be photoperiod, which is characterized by light intensity and the time of sunrise, both of which affect the micro-weather conditions in a specific area. Thus, the time of sunrise coupled with light intensity (e.g., clear vs. cloudy skies) affect the weather conditions on a small scale, which in turn, have a direct influence on the timing and intensity of singing activity. The main conclusions you should draw from this very short discussion of singing activity is that the best time to listen to bird songs is during the early part of the breeding season and in the early morning hours, when winds are light and temperatures are cool. This certainly does not mean you should never listen for birds at other times of the day or during different periods of the breeding season. In fact some birds never seem to stop singing (and yes, I am referring especially to that champion singer, the Red-eyed Vireo). But this does mean that the bird community in an area will change, and the species you heard one day may be different from those you hear a couple of weeks later. This is especially important if you are participating in a bird survey project in which it is necessary to record all of the species which may be nesting within a certain area. Birders should visit their survey areas at different times of the spring and summer seasons, to maximize their chances of recording all bird species, not just the obvious ones. For those people who are simply interested in seeing as many species as possible, this change in singing behavior means that you should return to an area already visited; it’s not uncommon to find several different species on a return visit.